TenRen's Ginseng Tea consists of crushed and grounded high quality American ginseng. 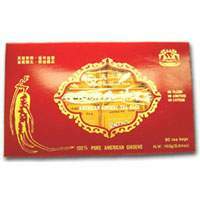 American ginseng is considered to be the finest ginseng available worldwide. Ginseng tea has a very light yellow hue, an earthy ginseng aroma, and a pure taste and lasting aftertaste. Ginseng has long been a highly valued herb in Asia. These tea bags are a convenient method to enjoy the beneficial properties of ginseng.